Deepcool has really been upping their game recently and we've seen numerous coolers, cases and fans hit the market from them. The first fans they produced had lots of features and great ideas, but the fans themselves did not match the goodness that surrounded them. Since then, DeepCool has gone on to make a number of innovative products. Now, in new Gamer Storm brand, they bring us the new Deepcool GF120. 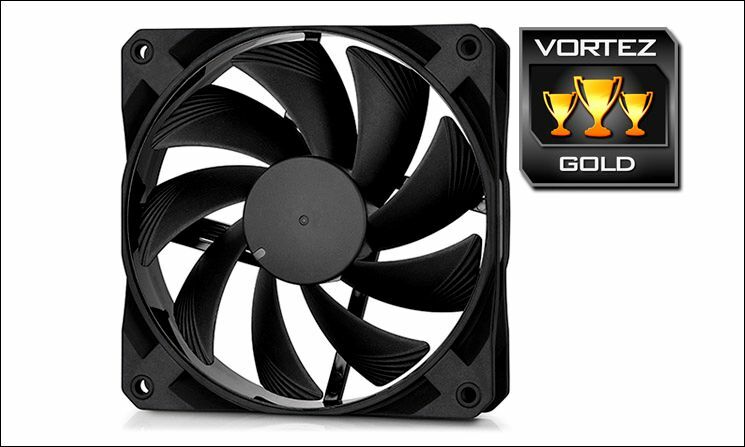 Deepcool has made a fine fan in the GF120. And although it has a price-rag of $19.99/€19.99 it stands up to any other twenty-dollar fan, with ease. For such a quiet fan (only 32.5 dBA) -- it pushes a nice amount of air, including pulling air through filters and pushing air through radiators. In fact, the fan's output matches the published specs, and the noise it makes does not exceed them. And then Deepcool provide P-Q curves for the benchmark RPMs -- few companies do this. The GF120 comes with the most important accessories – the world’s best vibration isolators, plus a Molex-to-7v adapter. Deepcool also has an accessory that is in plain sight -- the rubber covering that reduces any vibration that the fan might create. Finally, you can throw the packing away and know you’re not destroying the environment. The fact that the GF120 is a PWM fan puts it ahead of most of its competitors. Their PWM circuitry is silent. No clicks at all. And what's even more signficiant is that the entire thing is waterproof. The bottom line on the GF120 is that it has the features that matter most to enthusiasts and whilst doing so is attractive too. As for Deepcool improving their products as far as they have, let us hope they continue to do so. + Deepcool’s published specs are right on. + Comes with a 7-Volt noise reducer. + Survives a dunking and runs fine. - Deepcool should certify this fan for an IP code.